History: I've been making this recipe, although in much larger quantities, for 20+ years. It's always been a big hit with chowder lovers! Description: Clams, potatoes and onions in a not-too-thick creamy concoction! ground white pepper, 1/4 tsp. 2. Strain the broth through a filter, chinois or cheesecloth and reserve it. Keep the broth warm for use later. 3. Cook the potatoes in lightly salted water until they are fork tender. Drain then set aside loosely covered with plastic wrap and let air dry and cool. 4. Pick clams from the shells, slice, remove belly grit, chop, and reserve the clams. 5. Render the salt pork in a pot with the clarified butter until the salt pork turns a light golden color but not brown; add the onions and sweat until they are translucent. 6. Add the flour; cook to make a blond roux, about 4-5 minutes on a medium-low flame. 7. Add reserved 2 cups of broth and incorporate it completely first adding half, working out any lumps that might form with a wooden spoon and a whisk, add the remaining stock and repeat the incorporation as before. Bring it to a boil and simmer for 3 minutes, add warm light cream gradually and incorporate it completely. 8. Simmer for 10 minutes, skimming the surface if necessary. 9. Add the clams, heavy cream, potatoes, salt and white pepper. Simmer 7-8 minutes on low flame to heat and meld the flavors. 10. 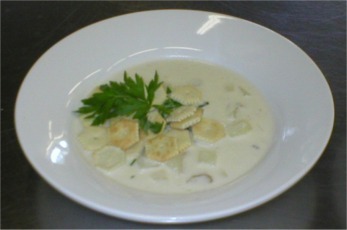 Serve with a sprig of parsley and oyster crackers sprinkled on top the chowder. Note: You can use margarine, leave out the salt pork, use milk in place of the cream. Canned clams and clam juice will work well too! But beware, it won't be the real thing!